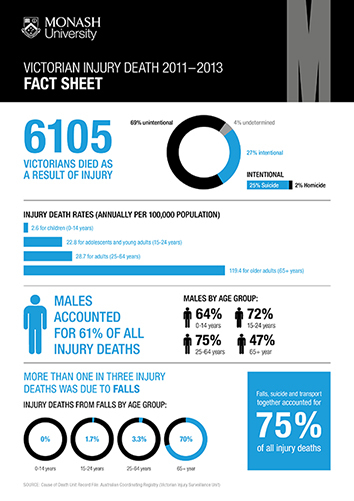 VISU holds de-identified data for Victoria on injury deaths, hospital admissions and Emergency Department (ED) presentations. Data are held on three separate datasets - they are not linked. Death data are supplied by the Registry of Births, Deaths and Marriages, Victorian Department of Justice. Hospital admissions and emergency department presentations data are supplied by the Department of Health. You can request data and information by filling in the data request form. Injury is commonly defined as ‘any unintentional or intentionaldamage to the body ... caused by acute exposure to physicalagents such as mechanical energy, heat, electricity, chemicals,and ionizing radiation interacting with the body in amountsor at rates that exceed the threshold of human tolerance'. An unintentional injury is an injury that is unintended. It is often described as an accident. We try to avoid using the term ‘accident' as it implies that injuries are random events due to chance. An intentional injury is an injury as a result of intended acts by people. That is, harm of one person by another (assault, homicide, neglect) or self-harm. An injury death is defined as an injury or poisoning by an external cause (transport crash, fall, suicide, drowning etc.) that results in a person dying either in or out of hospital. In Victoria (and in other Australian states and territories) all deaths by external causes must be reported to the state coroner. An injury hospital admission is defined as an injury or poisoning that results in the person being admitted to an inpatient bed (a ward, short stay observation unit, emergency medical unit, medical assessment and planning unit, intensive care bed, mental health bed or coronary care unit) and subsequently discharged alive either on the same day (after at least four hours from the time patient management begins) or after one or more nights stay in a hospital bed. An injury emergency department (ED) presentation is defined as an injury or poisoning that results in a person presenting to a hospital emergency department for treatment who is triaged (assessed for urgency), including those patients who leave before treatment commences. A non-admission is a person who is discharged from the ED within four hours of the time patient management commences. A child is usually defined as a person aged 0-14 years. An adult is usually defined as a person aged 15 years and older. These definitions apply because age data are usually grouped into five-year age groups (0-4, 5-9, 10-14, 15-19 etc.). Injury death records are supplied to VISU by the Australian Coordinating Registry (ACR). The COD URF records are compiled and coded by the Australian Bureau of Statistics (ABS) based on data from the Registrars of Births, Deaths and Marriages (RBDMs) and the National Coroners Information System (NCIS) and this data is transmitted to VISU through the ACR. The Registry database consists of data from the various state and territory registrars of births, deaths and marriages. It is a legal requirement of each state and territory that all deaths are registered. As part of the registration process, information on the cause of death is either supplied by the medical practitioner certifying the death on a Medical Certificate of Cause of Death, or supplied as a result of a coronial investigation. Data in the Causes of Death (COD) collection include demographic items, as well as Causes of Death information, that are coded according to the WHO International Classification of Diseases (ICD): Ninth Revision (ICD-9) from 1979 to 1996 or Tenth Revision (ICD-10) from 1997 onwards. The external causes chapters of ICD 9 and ICD 10 describe the causes of injury, poisoning and adverse events (complications of medical and surgical care). Deaths due to adverse events are not usually included in VISU reports. Due to a revision process on COD data compilation post 2006, there was a delay in data receipt at VISU by a couple of years. The first release after this delay was in April 2015 for the reference period 2006-2012. For VISU reports, deaths are selected by reference year (collection cycle in which a record was included in ABS counts). VISU holds unit record data on injury deaths (deaths due to external causes) for 1970, 1975, 1980, 1985, 1990-2006 and 2006-2016 (revised process). Multiple ICD-10 codes from any or all of the chapters of the ICD-10 manual can be assigned to each death record. Underlying cause of death - transport, fall, poisoning etc. Associated causes - includes all other causes and conditions reported on the death certificate from any chapter of ICD-10. Human intent - unintentional; intentional-assault, neglect, self-harm; undetermined intent. Intent information is derived from the external cause of injury code. Body region injured - head, thorax, shoulder, upper arm etc. Body region information is derived from the injury diagnosis variables. Nature of main injury - open wound, fracture, dislocation/sprain/strain etc. Nature of main injury is derived from the injury diagnosis variables. Hospital admissions for injury and poisoning that contain an external cause code are extracted from the VAED by the Victorian Department of Health (DH) and supplied in de-identified unit record format to VISU annually. The file is cleaned, checked and merged with the VISU-held VAED dataset. From July 1998 cases recorded on the VAED are coded to ICD-10-AM-the WHO International Statistical Classification of Diseases and Related Health Problems, Tenth Revision, Australian Modification. The Australian Modification of ICD-10 has been developed by the National Centre for Classification in Health (NCCH) at the University of Sydney with assistance from clinicians and clinical coders to ensure that the classification is current and appropriate for Australian clinical practice. The Australian Modification of ICD-10 is updated every two years and the development of ICD-11 is in progress. Up to June 30, 1998, cases were coded to ICD-9-CM. The external causes chapters of ICD-9-CM and ICD-10-AM describe the causes of injury, poisoning and adverse events (complications of medical and surgical care). Adverse events and sequelae (late effects) of external causes of morbidity and mortality are usually not included in VISU reports. In July 2012 the Victorian Hospital Admission Policy changed significantly meaning that patients who received their entire care within a designated emergency department or urgent care centre could no longer be eligible for admission regardless of the amount of time spent in the hospital. This has had the effect of reducing the number of admissions recorded on the VAED for the 2012/13 financial year. For this reason VISU suggests caution should be exercised when interpreting potential changes in the number of hospital admissions in 2012/13 compared with previous years. In July 2013 the Victorian Hospital Admission Policy changed slightly for patients admitted through the emergency department within the same hospital. The time of admission post July 2013 will be recorded as the time the patient was admitted whereas before this date the admission time was the time the patient presented to the emergency department. Separation type (patient destination on discharge from hospital): separation and transfer to acute hospital/extended care, death, separation to private residence/accommodation, separation and transfer to aged care residential facility, separation and transfer to mental health residential facility etc. Up to 40 ICD-10-AM codes from any or all of the chapters of the ICD-10-AM manual can currently be assigned to each record. These codes are then used to derive the following injury surveillance variables that are added to the VISU-VAED dataset. Cause of injury - transport, fall, poisoning etc. Activity when injured - sports, leisure, work etc. Human intent - unintentional; intentional-assault, neglect, self harm; undetermined intent. Intent information is derived from the external cause of injury code. Comorbidities - co-occurrence of injury with other diseases and conditions that can happen by chance or because there is some association between them (for example, suicide and mental disorders, drowning or hot water scalds and epilepsy). Co-morbidities are derived from the diagnosis variables (Coded to ICD-10-AM Chapters 1-17). Find out more about VAED. The Victorian Injury Surveillance System (VISS) began in the Royal Children's Hospital in 1989. It expanded to adult hospitals over time with a large boost in 1995 when the Department of Human Services absorbed the injury surveillance minimum dataset into the Victorian Emergency Minimum Dataset (VEMD) that collects demographic, administrative and clinical data from public hospitals. Reliable data are available from July 1999 onwards and from January 2004, VEMD data are collected by all 38 Victorian public hospitals that provide a 24-hour ED service. Emergency Department (ED) presentations for injury and poisoning are extracted from the VEMD by the Victorian Department of Health and supplied annually in unit record format to VISU (prior to 2004 VISU collected injury surveillance data directly from hospital EDs). Data are currently coded to the Victorian Emergency Minimum Dataset (VEMD) User Manual 21st Edition, July 2016-17 published by the Department of Health and Human Services. The VEMD contains both cases that are treated and discharged from the ED within four hours from the time patient management commences and cases that are treated for four hours or more in the ED or a short stay ward attached to the ED. When the data file is received by VISU, it is cleaned, checked and merged with the VISU-VEMD injury surveillance dataset. VISU is able to run data searches on any of the data items contained in the dataset to provide a customised report containing a set of tables and short interpretive summary. Human intent - unintentional, assault, self harm etc. Cause of injury - fall, poisoning etc. Place where injury occurred (location of injury) - home, road/street/highway etc. Nature of main injury - fracture, sprain/strain etc. Body region injured - head/face/neck, upper extremity, trunk etc. Request specific information from our database. Or phone +61 3 9905 1805 for enquiries. View reports on specific injury topics. Authorised by: Chief Marketing Officer, Strategic Marketing and Communications. Maintained by: Accident Research Centre Webmaster Team. Last updated: Sep 2018.